There are true stories, and then there's "War Dogs." 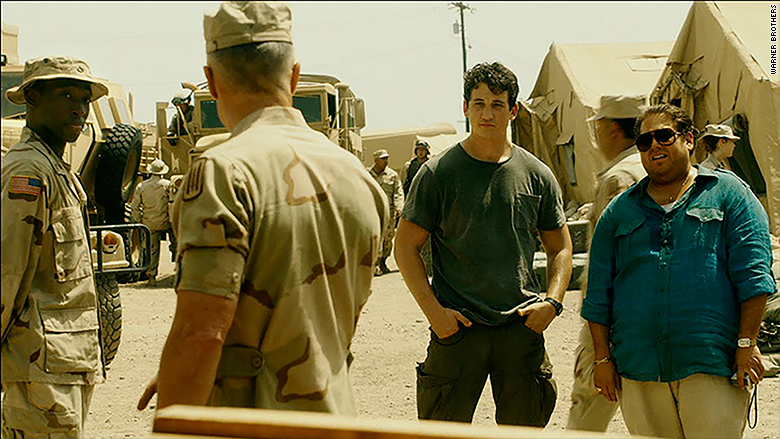 The movie, which stars Jonah Hill and Miles Teller and opens this weekend, tells the real life story of Efraim Diveroli and David Packouz, two arms dealers who won a $300 million government contract to arm U.S. troops during the Iraq War. Oh, and did we mention that Diveroli and Packouz were in their early twenties when they did it? The crazy but true tale, which is based on the Rolling Stone article "Arms and the Dudes" by Guy Lawson, is ultimately what drew Hill and Teller to the film. "The story itself really is just so crazy," Hill told CNN. "The idea that this actually happened, you would not believe it if didn't actually go down." Hill added that as he dug into the complexities of his character, Diveroli, he became more interested in him. "He's so manipulative and shady and kind of evil," he said. "But he's able to pull all of that stuff off because he's charismatic and able to win people over, so it's this really tricky kind of balance." Teller said the arc of the characters from small-time kids in Miami to the massive arms deal was what interested him most -- it was "unimaginable," he said. Jonah Hill and Miles Teller, break down how they brought the true story of two arms dealers to life in "War Dogs." Director Todd Phillips told CNN the film is more of a criticism of the government than Diveroli and Packouz. "The fact that these two kids who had a small office in Miami landed this deal with the Pentagon -- it made you realize that the vetting process, the system of checks and balances in the government is not necessarily all there," he said. Phillips, who has directed hit films like "The Hangover" and "Old School," said that his prior work influenced "War Dogs" but that this movie ended a bit differently than those. "With this movie they just quickly get in over their heads, and like in 'Old School' and 'The Hangover' they make some bad decisions that put them in some precarious positions," Phillips said. "But unlike those movies where it pulls them together, it kind of separates these guys." He added that the film has a tragic ending, one that may not be the fault of the two characters involved. "I think they take the fall," Phillips said. "In weird way the movie's really an indictment on the government and their process... these guys end up paying the price for it."